War of 1812 (1812-1815)--Sometimes called the Second American War of Independence, this conflict pitted the young United States against her old colonial ruler, Britain. The war began over leftover issues from the first American-British War, and from Britain's ongoing wars against Napoleon and France. 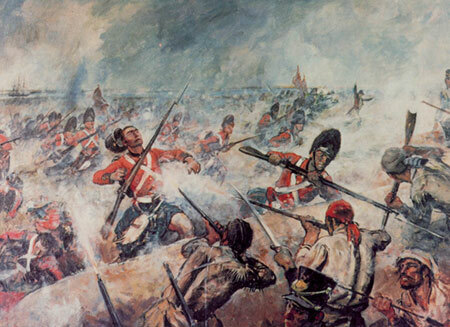 This second Anglo-American war began in 1812 and ended in 1815. Over 1,600 British and 2,260 American soldiers, marines, and sailors perished in this war on both land and on the ocean. While at war with the United States, Britain was also fighting against France and her allies in Europe. Due to their war with France, the British sought to restrict American trade with France, and imposed a set of restrictions which the U.S. considered illegal under international law. The U.S. declared war on Britain on July 18, 1812 after years of enduring British restrictions and attacks on American shipping, the forcible impressment of thousands of American sailors into service with the British navy, increasing anger at British restraints on American trade with France and other European nations, and frustration at continuing British military support for Native Americans fighting against the expanding United States. When war was declared by the United States in the summer of 1812, the American military was woefully unprepared for conflict with the world's most powerful empire. Even though the British were engaged in a life and death struggle with Napoleon's France, troops were sent to reinforce British Canada and to battle the Americans. The war that developed was a repeat of the American desire to invade and absorb Canada. Just as in the American Revolutionary War, British and Canadian forces beat back an American invasion. Modern Canadians trace the first true inkling of their nationhood to this war and the Canadian contribution to their own defense. Fort Bowyer, in Mobile, Alabama. Recieving word the next day of the signing of the Treaty, British forces abandoned the fort and left American territory. On February, 18, 1815, President James Madison officially notified Congress of the Treaty of Ghent, thereby ending the war. *An estimated 15,000 total deaths occurred due to the war on the American side. As is typical of warfare in this era, more deaths occurred from disease and other causes than through actual battle wounds and causes.